It takes “Two” to make a thing go right. ROUND ONE: WHO HAS THE BETTER COVER ART? Alright, this one’s fairly easy for me. Though I appreciate the creativity that went into building the “Army of Two” title out of the smaller “army of two” bits, I’m not a fan of the salmon-colored background and Murs, himself, just looks like a combination of bored and upset. Was that an outtake shot? I mean, would it hurt to give him a marching band leader outfit? This is supposed to be fun! I love the Williams cover, however. Yes, it’s a white base, but the paint oozing down his face and onto his neck is an awesome effect and pops really well. Oh, and he’s smiling too. At least, I think he is. It has a boyish charm about it. Even if I didn’t know who he was or what he sang, I would totally stare at it in a record shop. Good times. Verdict: This one for sure goes to Robbie. That puts him up 1-0. ROUND TWO: WHO HAS THE BETTER SINGLE? Let’s start off with Williams this time around and his third single, “Be A Boy”. Williams wrote the single with Tim Metcalfe and Flynn Francis and it was produced by Jackknife Lee; that combination is pretty much responsible for much of the album. Metcalfe and Francis are relative newcomers, both from Australia, while Lee has produced for acts like R.E.M. and U2, among others. “Boy” is an 80’s-inspired effort and yes, I am a sucker for a sassy saxophone solo, so that’s a plus. The message of it is what you probably expect it to be: the dreams of youth and the “magic” that goes away when you grow older. As Williams sings, “They said it was leaving/They said it with joy/Now I can make this last forever/And be a boy.” Yet, there is also a desire to find comfort in knowing that you can still find the boy in yourself as you age: “I’m half your age and lived twice your life/Now I don’t sleep alone at night/Your time did come but it’s long gone/Takes a big man to be someone.” It’s a relatable tune, and you can still dance to it with all those fluffy pop synths and chants. On the other side of the ring, we have the second single from Murs, “Army Of Two”. He penned the song with Wayne Hector, Iyiola Babalola and Darren Lewis while it was produced by Future Cut. Hector’s worked with a number of pop acts over the years and previously hooked up with Murs on his 2010 single, “Thinking Of Me”, which went top 5 in the U.K. in November. Babalola and Lewis are both a part of Future Cut, who previously worked with Lily Allen on hit singles “LDN” and “Smile”. It begins with a lush crescendo of strings, the tap of a drum, and, oh, hey, let this pop confection take over. The song itself is a dedication to his fans, with lyrics about staying together as a troop (“we’ll be swimming in the same direction/and we’ll never lose this connection”), the goals and standards of the mission (“Oh, faith is the bullet/Hope is the gun/Love is all we need”) and perseverance in the battle (“Now, march with the band/Raise your right hand/We’ve only just begun.”) Yes, it’s a tad cheesy, but I think the sentiment works, plus the arrangement is a nice fusion of the traditional and modern-day popular sounds. I think you’ll want to join the gang too. Those snare drums are pretty hot. 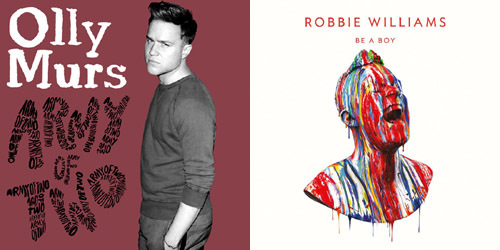 Verdict: I do like both, but I’ll give the edge to Olly; it’s a strong song and it’s already on my personal chart. Each is tied at 1. ROUND THREE: WHO’S MORE LIKELY TO GET A HIT? Verdict: Gonna leave this one at a tie. Too tough to decide. Let’s add up all the points… jeez, I was never good at math. Oh, you say they both have two points a piece? Well, well. I guess that means you’ll have to help me out. Which one do you like better: “Army Of Two” or “Be A Boy”? Or, are you stuck like me and enjoy both? Let me know in the comments or on Twitter: @AdamFSoybel.